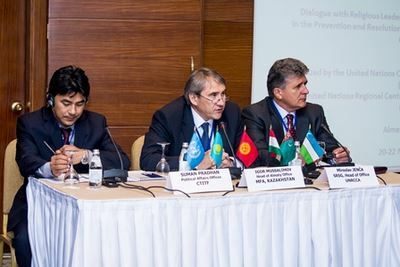 On 20-22 November 2013, a 2.5 day regional workshop was held in Almaty, Kazakhstan as a dialogue between leaders of religious institutions and security officials on cooperation towards countering extremism and preventing conflicts. The workshop brought together 45 representatives of religious establishments (state bodies on religion and representatives of Muftiats), representatives of national security committees and ministries of Foreign Affairs, experts in religious affairs from the region, international experts/trainers, representatives of regional and international organizations and two Afghan religious scholars. The event was funded by the Multi-Year Appeal of the United Nations Department of Political Affairs (DPA) and was organized by UNRCCA and CTITF with DPA’s Middle East and West Asia Division (MEWAD) and Policy and Mediation Division (PMD). To share experiences among representatives of religious and security institutions in Central Asia and Afghanistan on challenges, opportunities and good practices in preventing radicalization, extremism and conflicts. To start a process of dialogue between representatives of religious institutions and relevant Government officials involved in law enforcement on common areas of concern around themes identified in Pillar I of the JPoA, including: a) mechanisms for institutionalizing dialogue, b) strengthening the legislative basis, c) countering extremism through education and d) promoting a culture of tolerance. To build the skills of participants in mediation, conflict resolution and the prevention of extremism through a day of training using lectures, exercises, case studies and experience-sharing from the region and from other parts of the world. Participants expressed concerns for the way that religion is being incorrectly used for political purposes to recruit the youth for extremist, radical and violent movements. They argued for the freedom of religion as an important right that should not be suppressed. Lack of knowledge about the true principles of main religions in the region makes the youth particularly vulnerable to misinterpretation and to the spread of ideas that incite hatred. They together came up with a series of recommendations for follow up activities and strategies to be undertaken by security officials, religious leaders and international organizations.